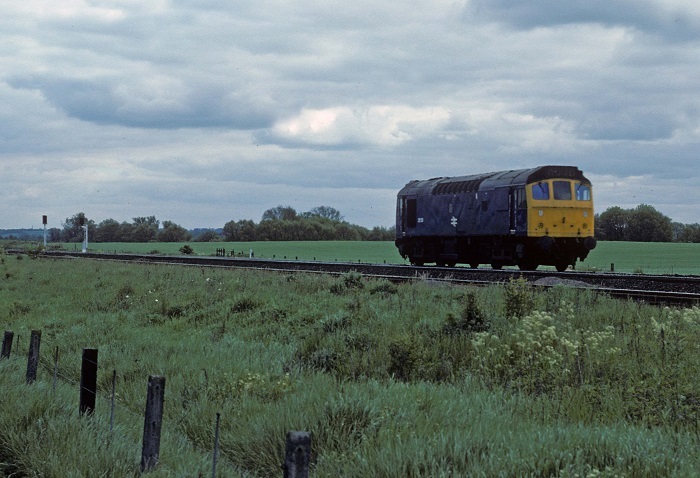 Photograph courtesy Roger Geach The rolling Bedfordshire countryside near Arlesey finds 25126 running light engine on May 30th 1977. The eighteen year six month career of D5276/25126 was spent allocated to a modest number of London Midland Region depots. Time between withdrawal and scrapping: 60 months. June 1964 to Trafford Park (9E). After withdrawal 25126 was stored at Newton Heath until June 25th 1984 when it was moved to Swindon Works with 25134, 25158 & 25208. The Works closed prior to 25126 being scrapped, it was sold to Vic Berry and moved from the Works to Cocklebury Yard on June 3rd 1987, reaching Leicester Humberstone Road on June 5th and into Vic Berry's yard on June 8th. It became part of the stack during October 1987, remaining pretty much intact until broken up during the middle of December 1987. 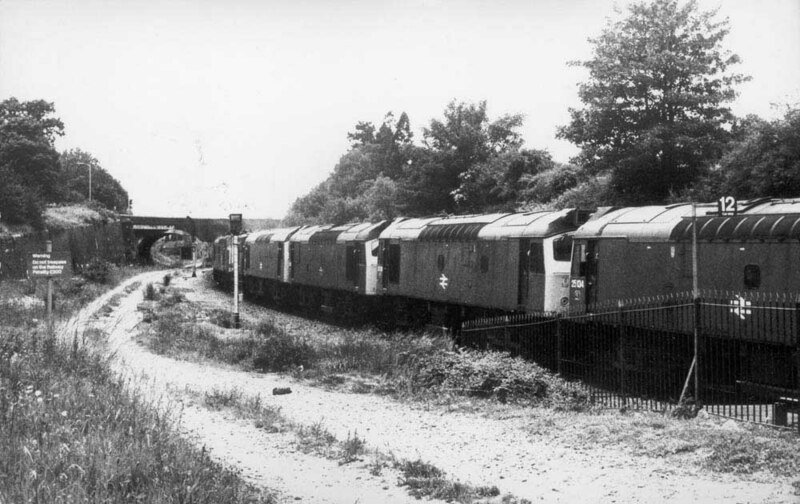 Photograph collection of webmaster On June 22nd 1984 a consist of five locomotives headed south through Cheltenham. An unidentified Class 37 was in charge of 25126, 25134, 25158 & 25208 on their movement towards Swindon Works for scrapping. Noted Derby Works June 1966. 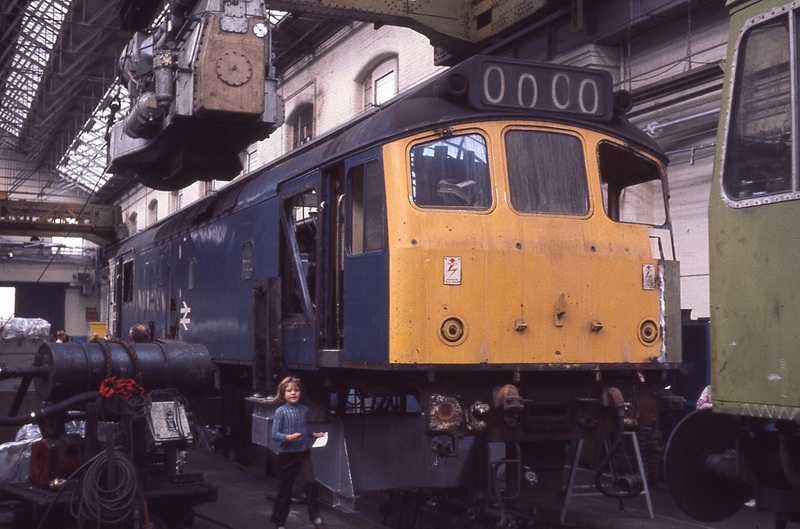 Noted Derby Works April 1979 (N4 repairs). **There appears to be an error with the 1976 record because at least until August 1977 25126 had its numbers on the bodyside panels, perhaps the records have the wrong year on them? One more thing to research? 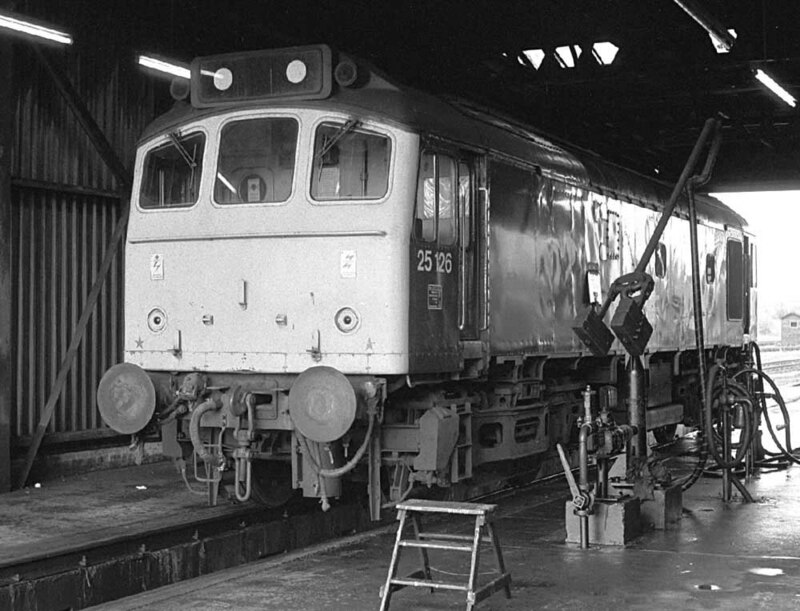 During March D5255 & D7586 were transferred to Trafford Park (9E), presumably to be trialled on the limestone workings. D5255 was transferred back to Toton during April, but D7586 remained allocated to Trafford Park until January 1965 when it was briefly reallocated to the Nottingham Division, but returned to Trafford Park the same month. With the testing completed the decision was made to utilise the Sulzer Type 2's on the limestone trains. To accomplish this seven Type 2's would be allocated to Trafford Park (9E) shed. All the locomotives selected were virtually brand new and had been on allocation to Toton (D16) after delivery from the workshops. D7586 which had been one of the locomotives used in the trials remained at Trafford Park, perhaps an odd choice since the locomotive was boiler equipped. The remainder were D5274 - D5279 and arrived during June & July. D5276 successfully completed its test run to Corby and back on June 9th. On April 11th a Manchester Victoria - Newcastle service was worked by 5276 & 5061. On August 1st the 09.20 Manchester Piccadilly - Yarmouth to Lincoln Central and the return 09.28 Yarmouth - Manchester Piccadilly from Lincoln Central were worked by sisters 5275 & 5276. On June 1st 25126 & 25125 worked the Derby - Norwich - Yarmouth - Norwich - Walsall diagram. The relief 09.30 Glasgow Central - Nottingham on August 3rd was worked forward from Leeds by 25126 & 25273. On the last day of August (31st) 25125 & 25127 worked a roundtrip Derby - Skegness. On November 16th the locomotive hauling the 06.45 Paddington - Birmingham New Street caught fire on the approaches to New Street station. The locomotive, Class 52 No.1037 was left in the station until 25126 came to take it to Saltley depot. On July 5th the Derby - Norwich - Yarmouth - Norwich - Walsall diagram was worked by 25126 & 25146. A week later on July 12th 25126 & 25125 worked the 08.00 Walsall - Yarmouth to Norwich. 25126 & 25324 were noted at Skegness on August 26th with an unidentified passenger service. 25126 worked a Tyne - Tinsley freight on October 3rd. During the early evening of April 14th 25126 was noted westbound passing Margam with a coal train. On June 5th the 08.00 Walsall - Yarmouth to Norwich and the 14.15 Yarmouth - Derby from Norwich were worked by 25126 & 25239. This most likely is not 25126, it would have had its numbers on the bodyside panels when coming into the Works, back to the note books to research! For the annual Open Day at Derby Locomotive Works on September 4th 1976 25126 was used to show how the engine was lifted to/from the bodyshell. The locomotive was at the Works for a major repair between July & October 1976, this was the last major repair received by 25126. The 08.52 Leicester - Skegness and the 12.35 Skegness - Leicester on June 11th were worked by siisters 25126 & 25127. On August 6th the Derby - Norwich - Yarmouth - Norwich - Walsall diagram was worked by 25126 & 25134. The same pair worked a Derby - Skegness roundtrip on August 8th and a Leicester - Skegness roundtrip on August 9th. On August 13th the 09.19 Manchester Piccadilly - Yarmouth between Sheffield & Lincoln Central and 09.15 Yarmouth - Manchester Piccadilly from Lincoln Central were worked by 25126 & 25213. The same pair followed with roundtrip Leicester - Skegness workings on August 14th, 15th & 16th. On June 17th the 08.00 Walsall - Yarmouth to Norwich and the 14.15 Yarmouth - Derby from Norwich were worked by 25126 & 25122. The next day (18th) 25126 & 25127 worked a Leicester - Skegness roundtrip. On July 12th a Leicester - Skegness roundtrip was worked by 25126 & 25101. Three days later (15th) the same pair worked the Derby (from Nottingham) - Norwich - Yarmouth - Norwich - Walsall diagram. 25126 & 25137 worked Leicester - Skegness roundtrips on August 28th (relief) & 29th. The 10.40 Euston - Aberystwyth from Wolverhampton and the 16.10 Aberystwyth - Shrewsbury on September 23rd were worked by sisters 25126 & 25125. The 07.30 Nottingham - Llandudno Town and the return 13.00 Llandudno Town - Nottingham were worked by 25126 on June 2nd. The 11.30 Cardiff - Crewe was worked by 25126 on June 19th. On February 28th the 15.15 Plymouth - Manchester Piccadilly was worked between Gloucester & Birmingham New Street by 25126 & 25134. The 09.27 Birmingham New Street - Llandudno Town was worked forward from Crewe by 25126 & 25221 on July 23rd & 24th. Three days later (27th) the relief 16.08 Derby - Exeter St. Davids was worked to Gloucester by 25126 & 25149. The 10.10 Euston - Aberystwyth from Birmingham New Street and the 16.10 Aberystwyth - Shrewsbury were worked by 25126 & 25114 on August 2nd. Towards the month end on August 30th 25126 & 25118 worked the 10.10 Euston - Aberystwyth from Birmingham New Street and the 17.55 Aberystwyth - Wolverhampton. The next day (31st) the same pair worked a Euston - Aberystwyth roundtrip from Wolverhampton to Aberystwyth. On the evening of May 5th 25126 was noted passing Broxbourne with the 19.50 (?) Croft - Leyton ballast, returning the next morning with the 02.43 Leyton - Croft empties. This was normally a Class 31 turn, its not certain if the Class 25 worked throughout or to and from Whitemoor. On May 30th a Stalybridge - Aberystwyth roundtrip dayexcursion was worked by 25126 & 25146. Two weeks later on June 17th an equally lengthy roundtrip Wellingborough - Rhyl day excursion was worked by 25126 & 25067. Three days later (20th) the 04.10 Shrewsbury - Aberystwyth and the 10.07 Aberystwyth - Euston to Wolverhampton were worked by 25219 & 25126. The 07.35 Nottingham - Llandudno Town and 13.26 Llandudno Town - Nottingham as far as Derby were worked by 25126 on July 11th, 25126 failed at Derby and was replaced by 25271. Photograph courtesy Tony Sayer 25126 sits on the fuelling rack at Newton Heath on July 25th 1981. The light has caught the side of the locomotive to reveal that the repanelling of the area occupied by the boiler room grille has been carried out from frame level to cantrail. On August 15th the 08.35 Derby - Yarmouth to Norwich and the return 14.20 Yarmouth - Derby from Norwich were worked by 25126 & 25115. The next day (16th) the same pair worked a Leicester - Skegness roundtrip. On August 9th (10th?) the 15.08 Birmingham New Street - Cambridge was worked forward from Leicester by 25126 after 31114 failed. 25126 was noted at Dorrington on September 12th with an engineers train. 25126 was withdrawn on November 28th 1982. Page added May 23rd 2014.